It’s that time of the year again, Tax Season! It’s that time of the year again, Tax Season! Make your tax service business number one with Top Class Signs and Printing promotional products. Our giveaways will have you and your clients feeling more at ease about the dreaded Tax Day. Remind your customers that tax time is right around the corner with printed items such as stress relievers, calculators, and more. Your clients and employees will have a constant reminder of your company while keeping track of their tax deadlines! Make sure these new clients have all your contact info on a full color business card or full color fridge magnet. Promotional items will have people coming in extra early for tax appointments. Facts: 70% of people have done business with an advertiser after receiving an item with their name on it? It’s true and it’s all the more reason to consider accounting promotional products from Top Class Signs and Printing as your next business investment. Whether you’re looking to drum up some new business or reach out to previous clients during the busy tax preparation season, promotional accounting products can help by keeping your name in front of your customers’ eyes. Accounting promotional products can be handed out at an open house, after a consultation, or when a tax job is completed. Everyone likes to feel special and appreciated! Make sure to have full color folders imprinted with all your contact information so that every time your prospects or clients search for their tax forms they will remember your company. There are several options available when it comes to accounting services promotional items; many more than appear on this page. 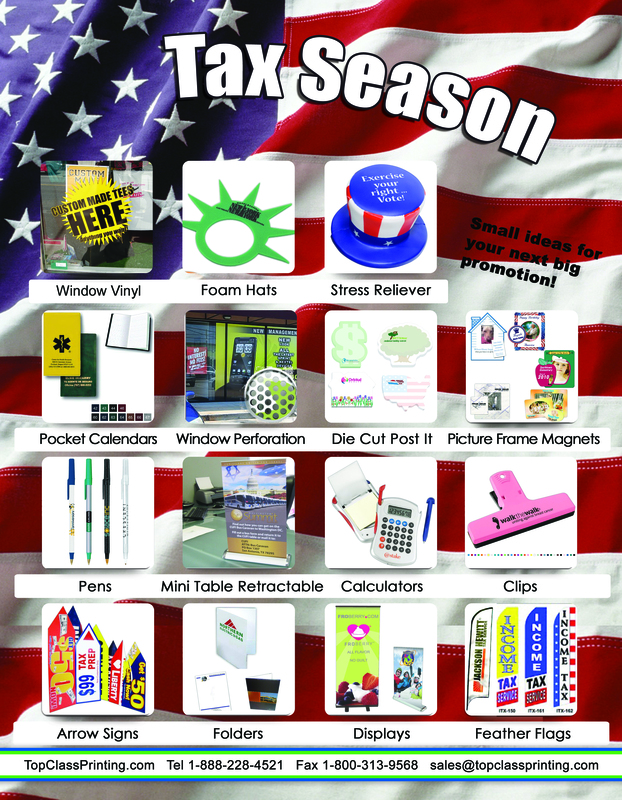 These are just a selected sampling of items that can be considered accounting promotional products. For more ideas, be sure to call Top Class Signs and Printing, we will be happy to help you find the perfect promotional accounting products to help you promote your business.